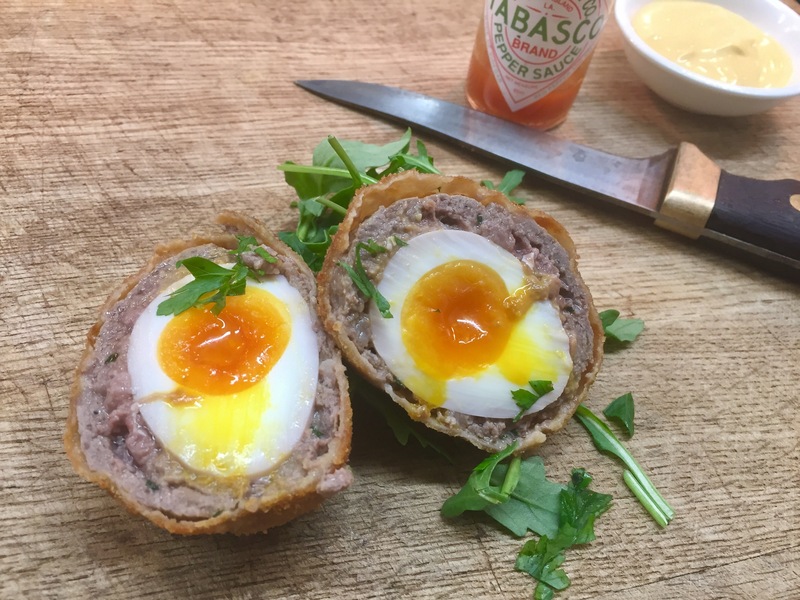 So you’ve done the hard yards and carried your meat home, now it’s time to turn it into something you can cook with. 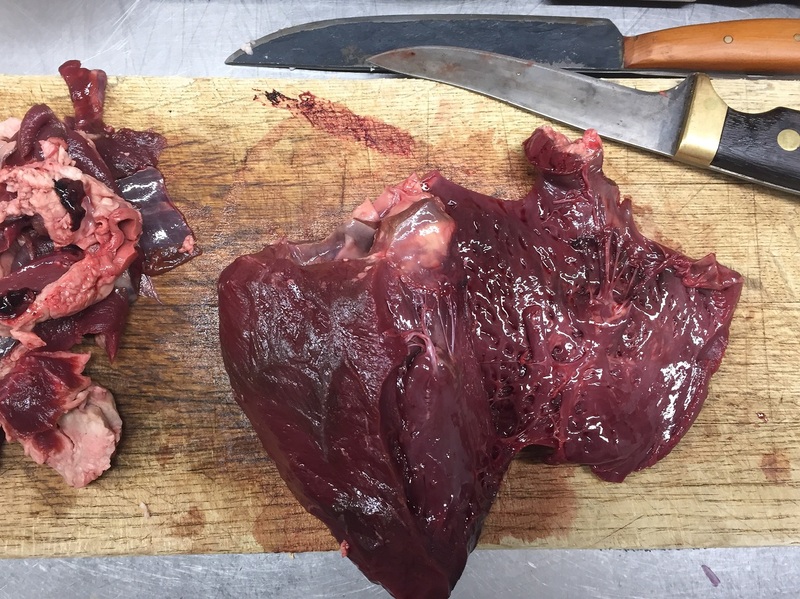 When breaking down a whole deer taking out the back steaks are pretty self-explanatory, just make sure that you run your knife hard up against the backbone to make sure you get all the meat. 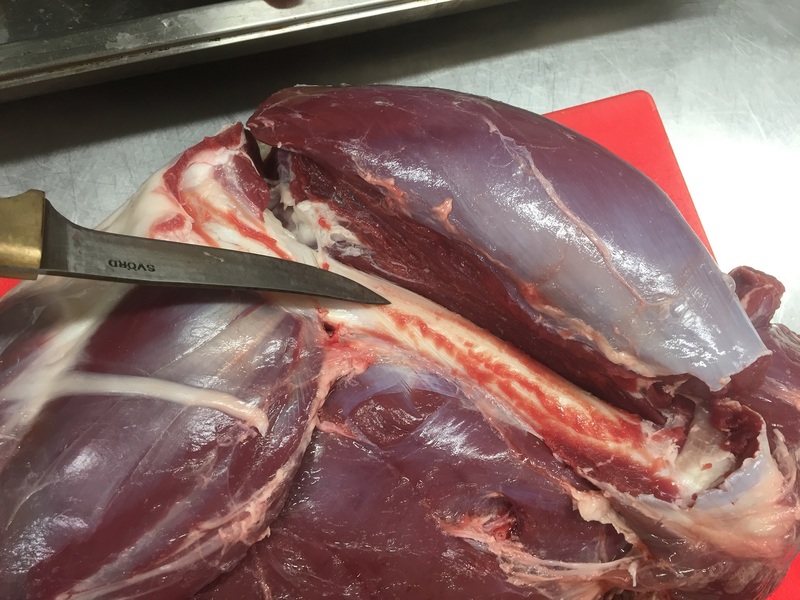 You can take off the shoulder by cutting away behind the shoulder blade and the hind quarters can be removed by going through the hip joint. 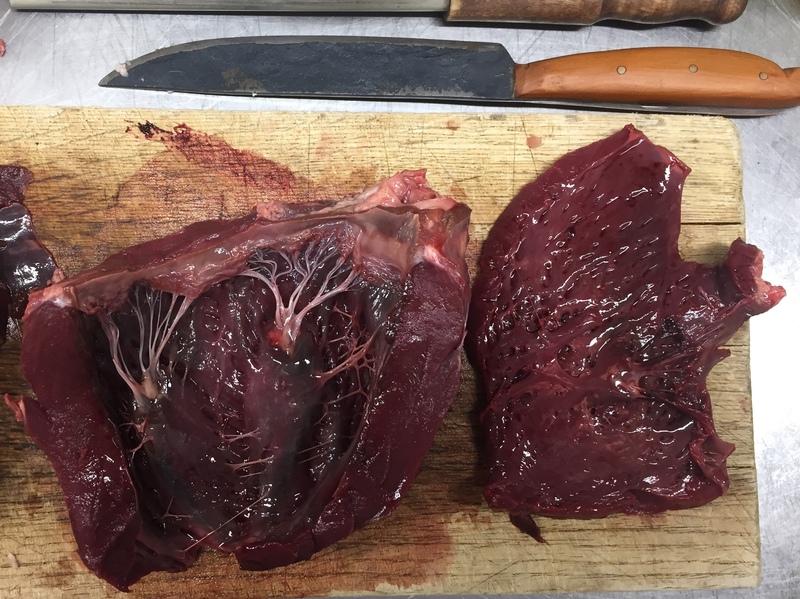 Make sure you don’t forget the inner fillets which run along the spine on the inside of the cavity and make sure you take the neck meat, it’s some of the best braising meat in my opinion. 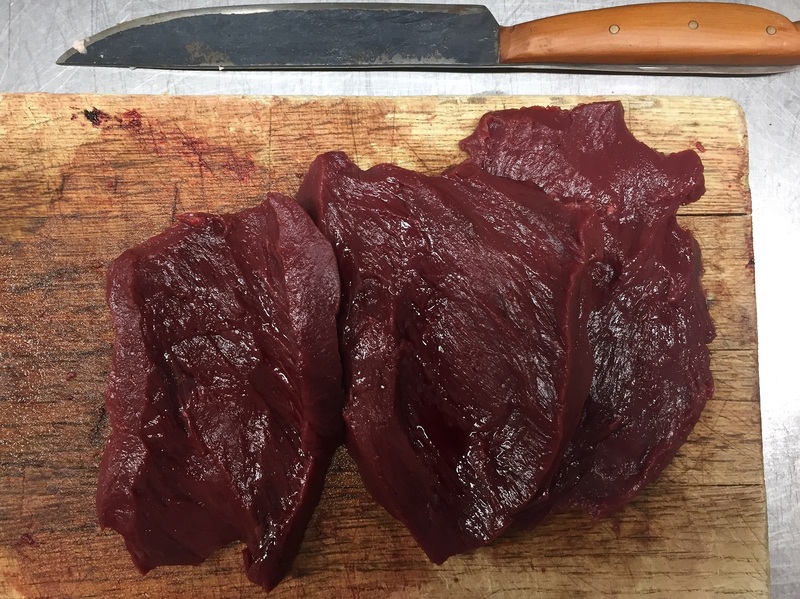 Personally I like to dice up the shoulder meat for stews, pies, curry etc and the back steaks I keep relatively whole for the BBQ or for pan frying. Don’t throw out any trim as this can be put through the mincer and used for things like meatballs, lasagne and chilli. 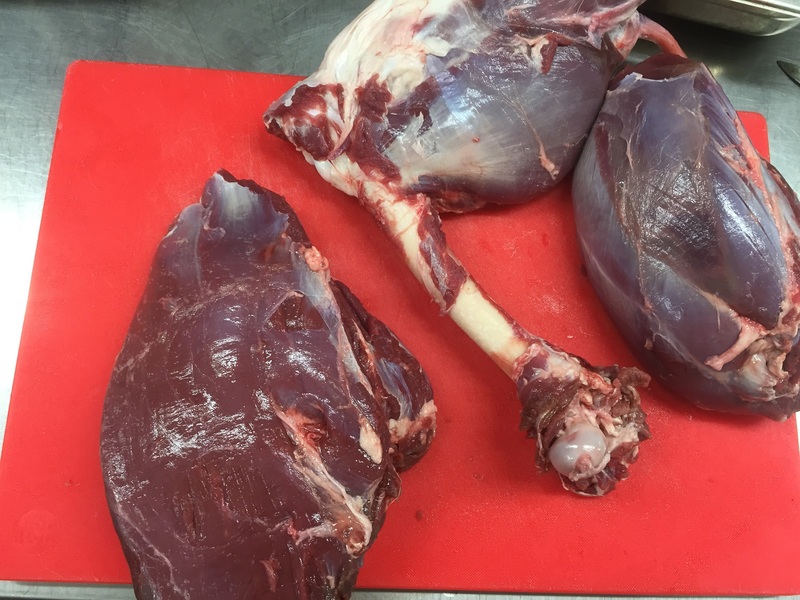 The hind leg is probably the most difficult piece of meat to deal with so that’s what we’ll be breaking down today. 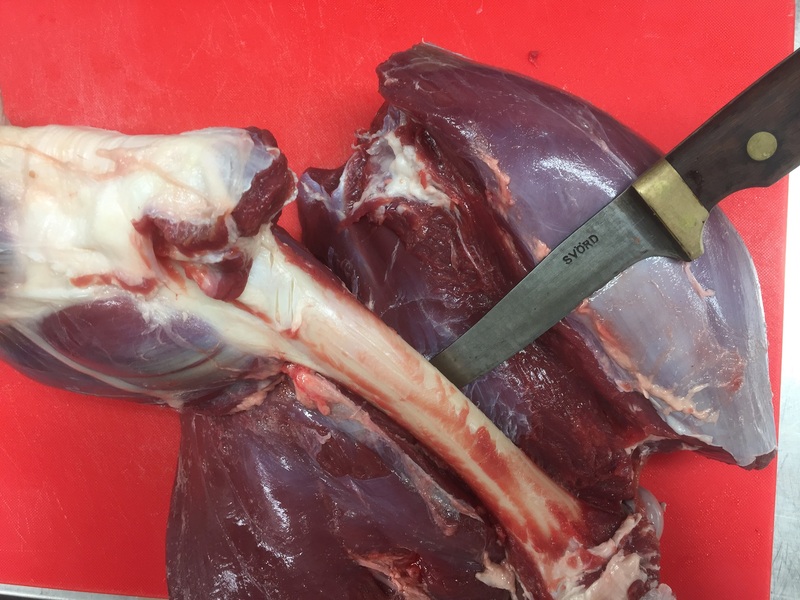 The hind leg is made up of four primal cuts (Rump, knuckle, topside and silverside) plus the shank. 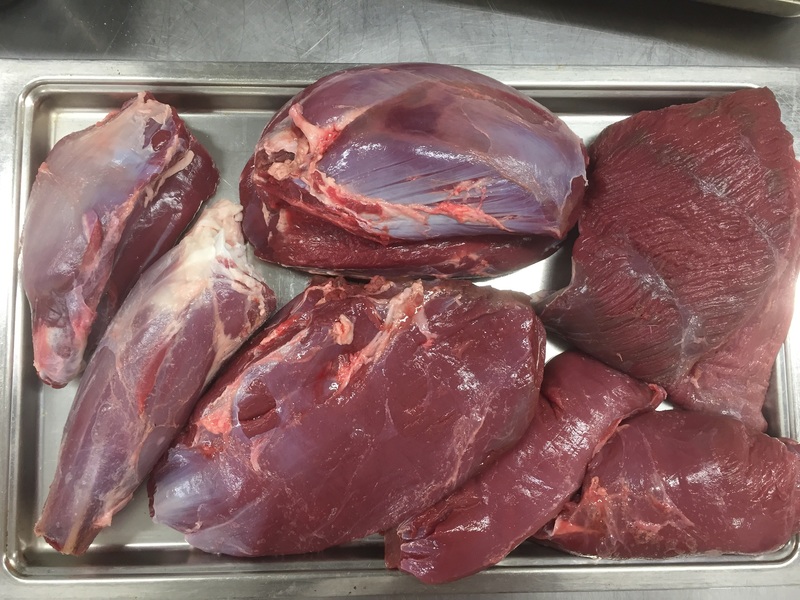 These four main cuts are collectively known as Denver leg and I use them interchangeably using a fast cooking method (fry, roast, BBQ etc) with the shank the only cut that I think always needs to be braised. 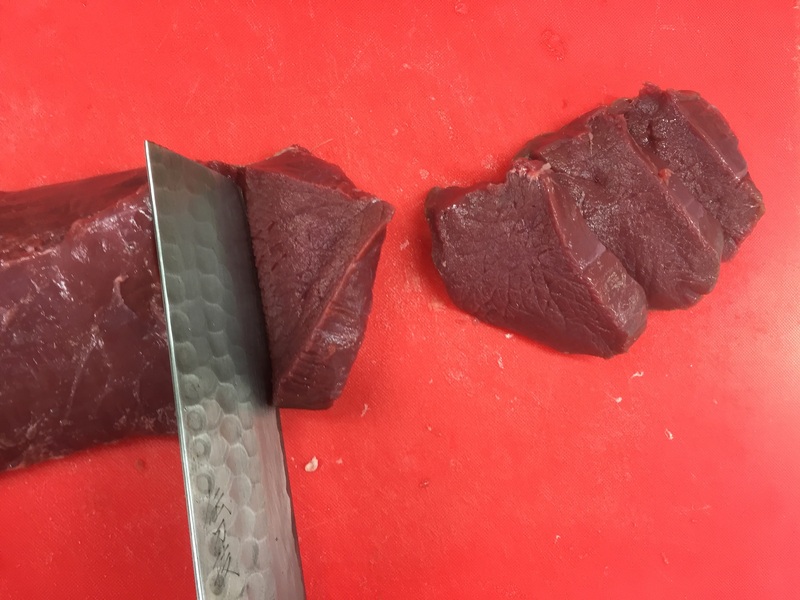 Depending on the age and condition of your particular animal you should be able to cook all these cuts as you would a steak, however once you’ve aged your meat to your liking and your meat is still tough one you may want to change to a slow cook method to make it nice and tender. Set your work bench up with all the gear you’ll need and place your leg flat on the chopping board. 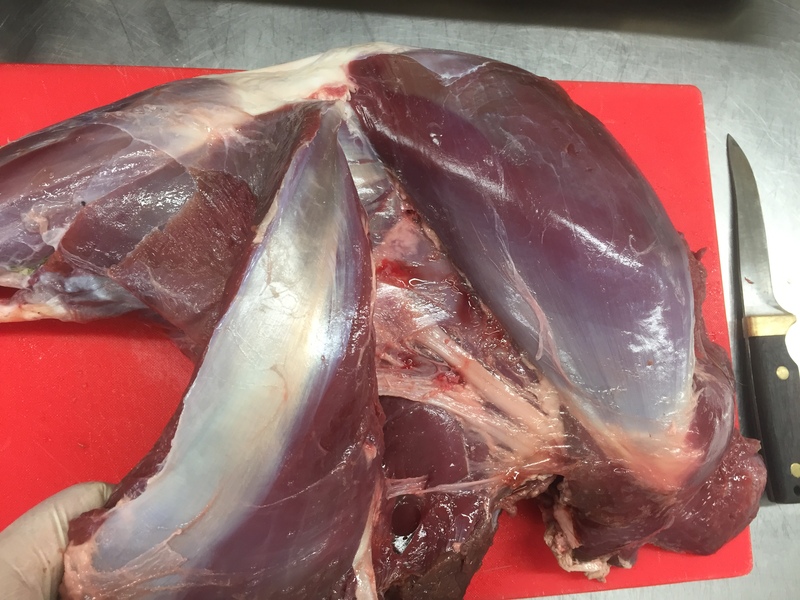 What we’re looking to do is to remove all the main muscle groups which are all separated by connective tissue. You’ll be able to pull away the muscle groups and use the knife to just help them on their way. 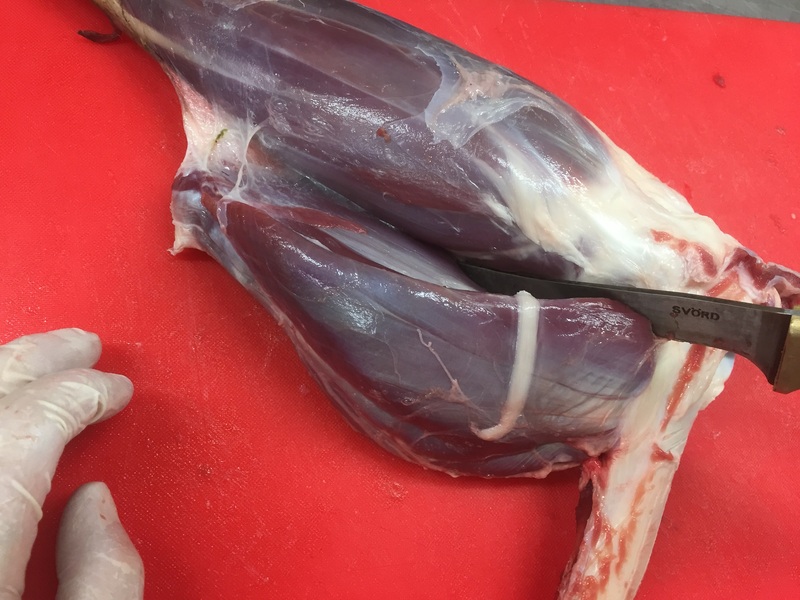 Once the muscle groups are opened up and you’ve exposed the main leg bone (femur) you can just cut away the muscle with the knife hard up against the bone, this way you don’t waste any meat. 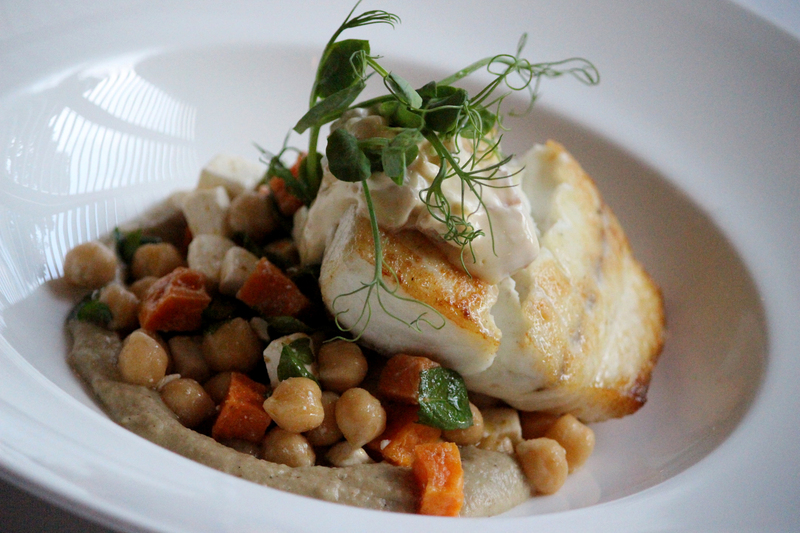 Keep following the seams and remove the main muscle groups off the bone and set aside. 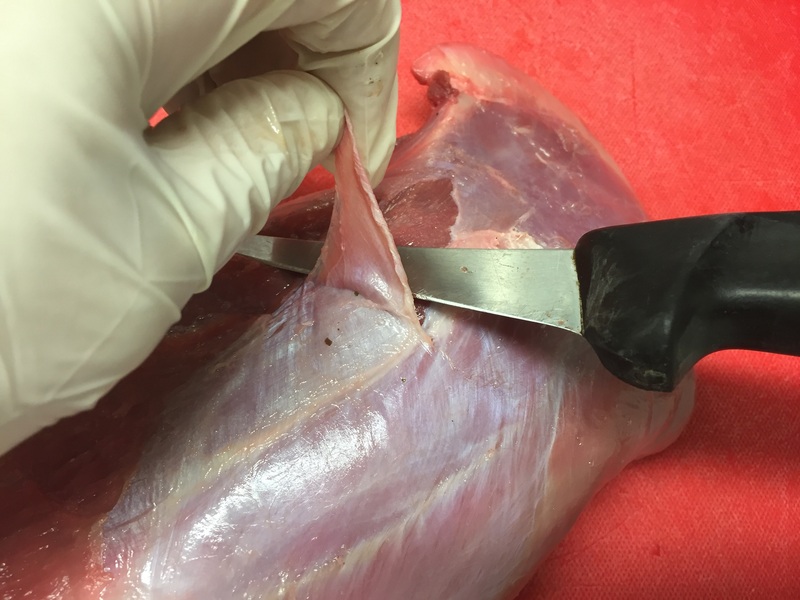 Remove the side muscle from the shank and keep this to one side for slow cooking. Cut through the joint and separate the shank and keep for slow cooking. 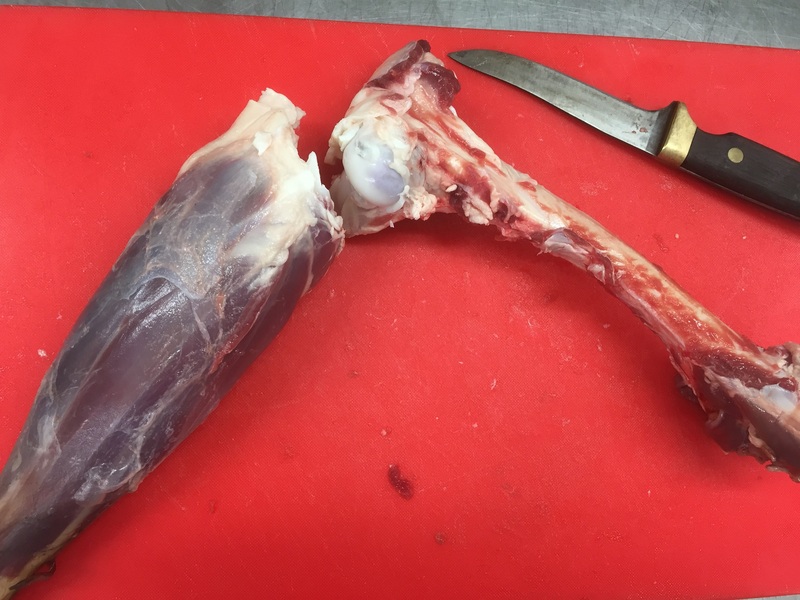 You can take the meat off the shank if you like or using a hacksaw remove the end of the bone so the shank fits better in your pot or slow cooker. The femur you can use to make stock of give to your dog and make his day. 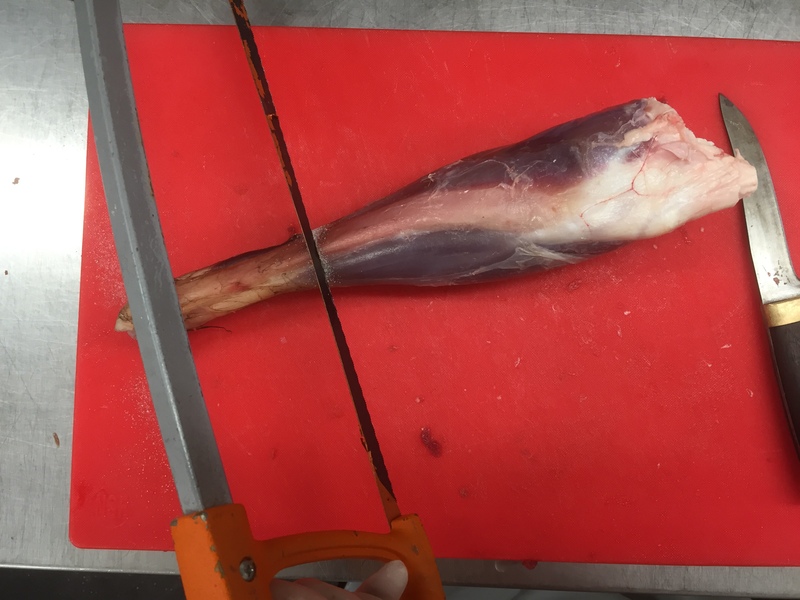 Now you will have your leg broken down into the main muscle groups you can follow the natural sinew lines and break each primal into its individual muscle groups. 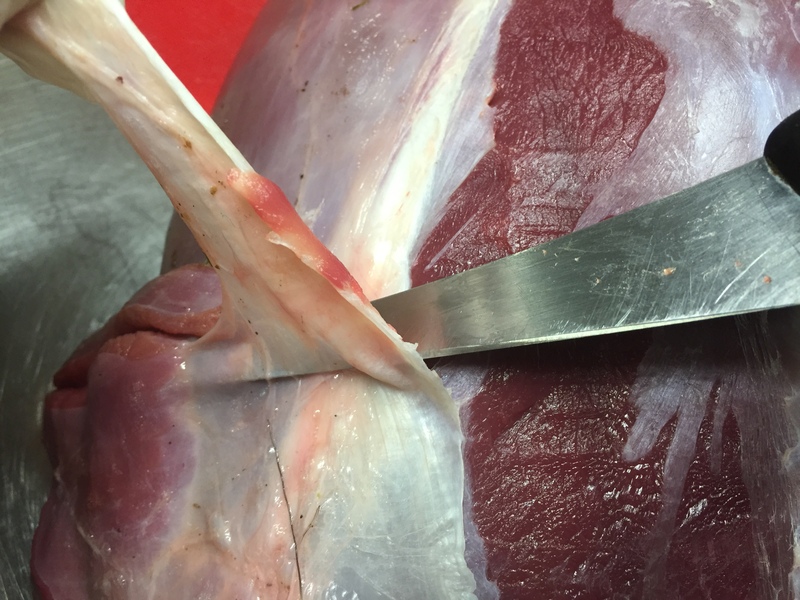 Remove all the membrane and silver skin by inserting your knife under the skin and with your knife angled upwards removing it by cutting it away in strips. If left on this will cook up very tough. 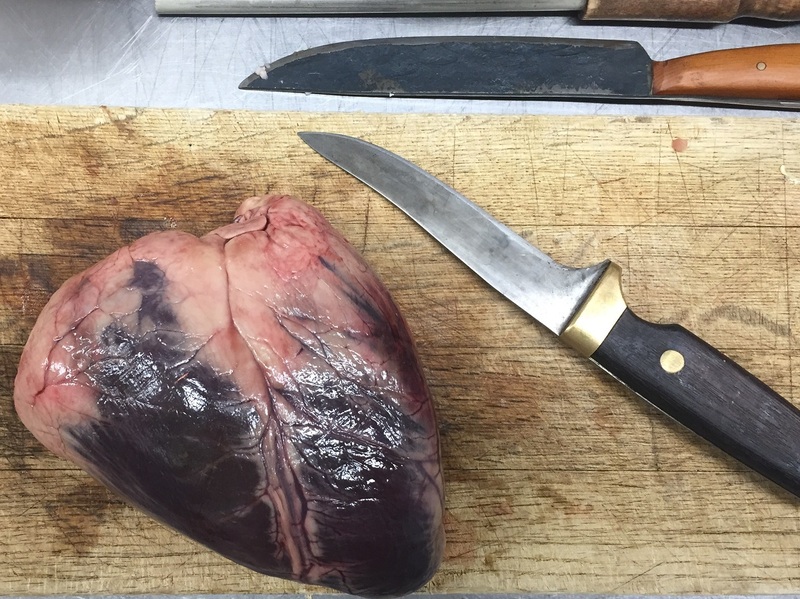 Now that you have your meat trimmed up you can go ahead and portion it how you like. 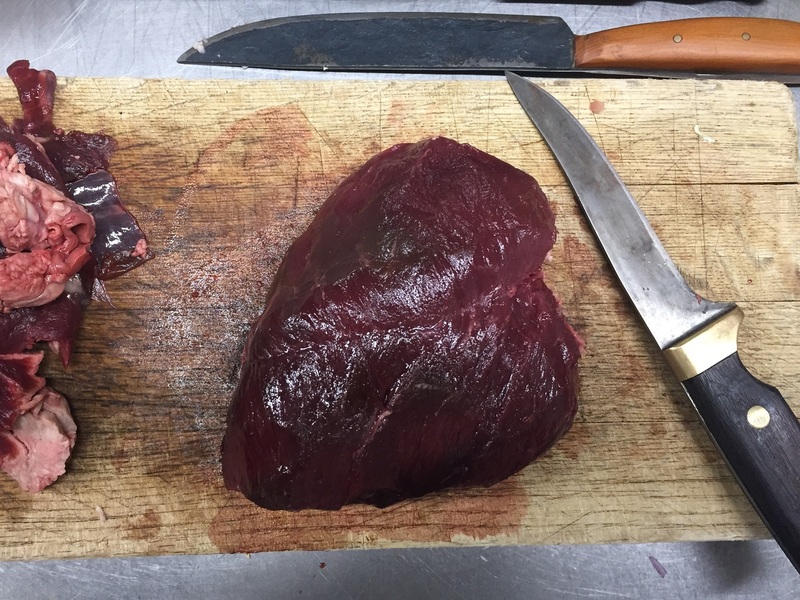 Either leave as whole pieces, cut into meal size chunks or portion into steaks or medallions ready for the BBQ. If you are going to freeze your meat be sure to make sure it’s wrapped well (this is where a vacuum packer earns its price) to avoid freezer burn. This recipe utilises the whole duck and because of the slow method of cooking in fat you end up with a tender, moist and flavoursome result. I recommend giving the Brussel sprouts a go as bacon always makes things better but if you don’t feel like making the accompaniments then serving with some nice buttery mash potatoes is the way to go. 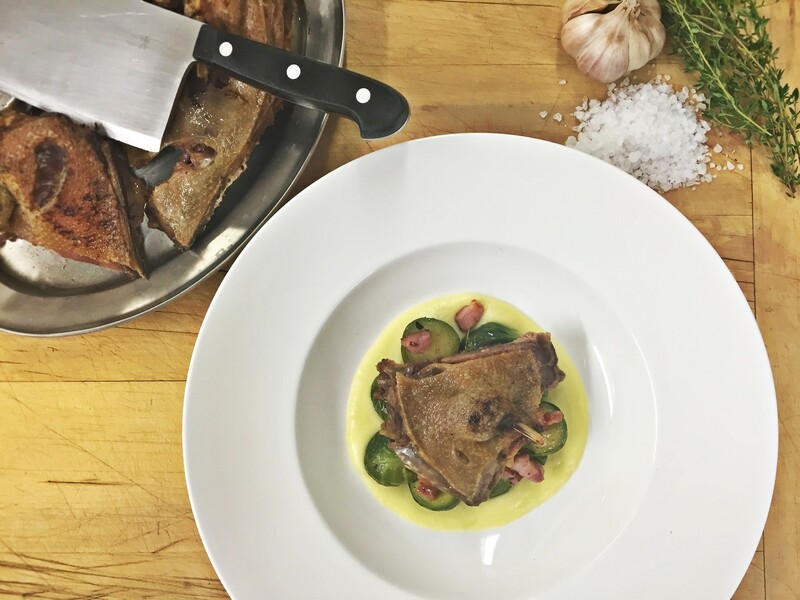 Place all the confit salt ingredients except the salt itself into a food processor or using a mortar and pestle coarsely grind together. Add the salt and briefly grind together until well mixed. 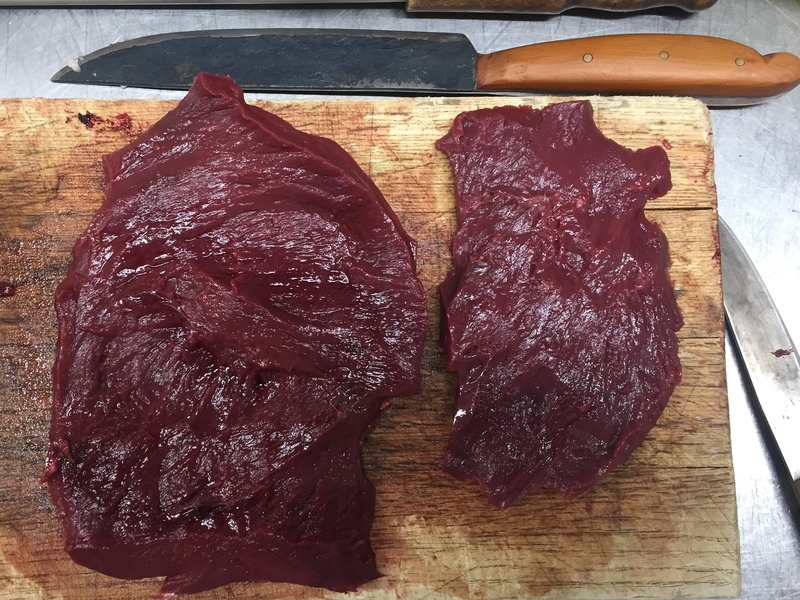 Cut the duck completely in half along the back bone and rub the salt mix all over and into both sides of the duck. Cover and leave in the fridge for 10-12 hours or overnight. After no more than 12 hours rinse off all the salt mix under cold running water and pat the duck dry on a kitchen towel. Place the duck in an oven proof dish and cover completely with rendered duck fat, cover with baking paper then tin foil and bake at 110C for 2-4 hours until the meat easily falls away from the bone. 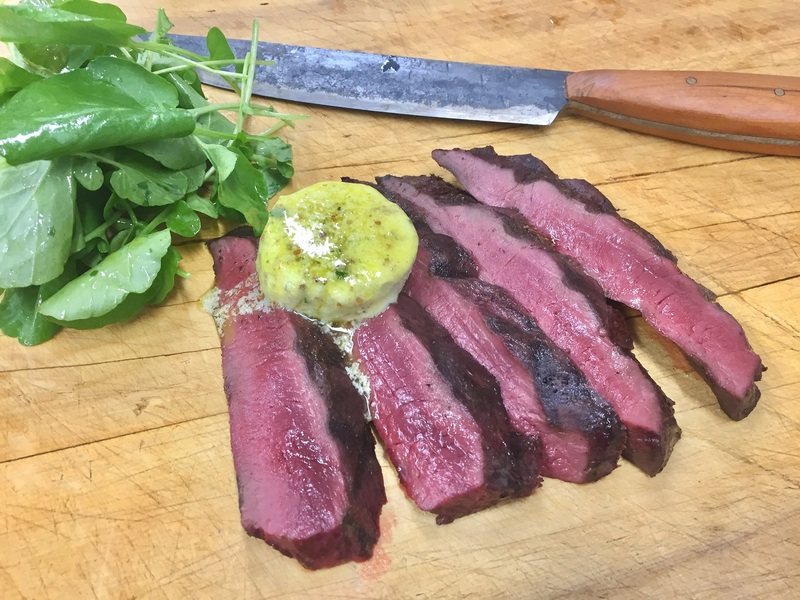 As long as the duck is covered in the fat it can be kept in the fridge for up to 3 months. 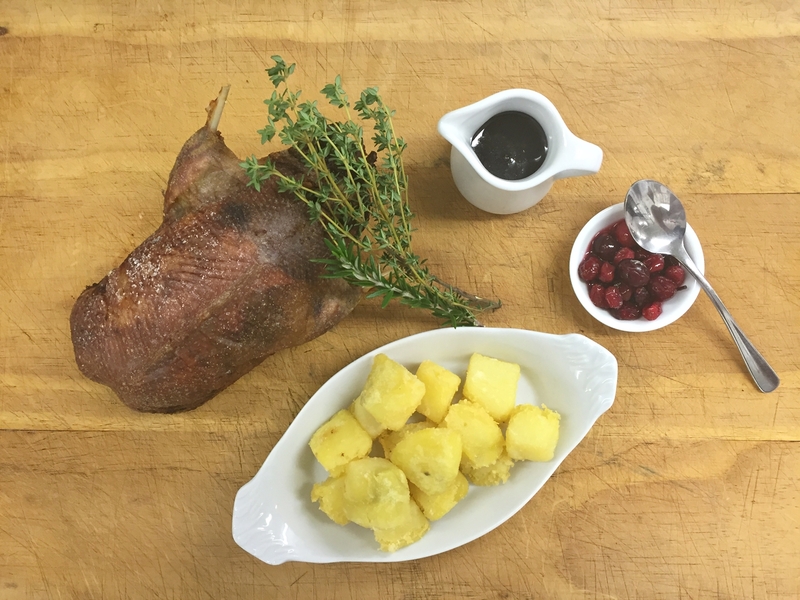 To serve, drain the duck out of the fat (keep the fat for next time or for roasting potatoes), then roast in a hot oven to crisp up the skin. Cut the Brussel sprouts in half lengthwise and cook in salted boiling water until they’re just cooked; about 5 minutes. Drain and keep to one side. Chop up the bacon and fry in a little oil for 1 min. Add to the pan the Brussel sprouts, butter, brown sugar and mustard and fry over a moderate heat until nice and brown. Season with a bit of salt to taste (keeping in mind the bacon is already a bit salty). Gently heat the milk, clove, peppercorns, bay leaf and thyme in a pot. Chop the onion into small pieces and roughly smash the garlic with the back of your knife. Gently cook the onion and garlic in a pot with the butter for about 4-5 mins until softened but not brown. Pour the hot milk mix on top of the onions and garlic and simmer gently for 10mins to infuse the flavours. Strain the flavoured milk into a pot, discard the onions and herbs etc and add the bread to the milk mix. Simmer for 3-4mins. Blend with a stick blender until smooth or leave chunky for a rustic sauce. Season with a pinch of nutmeg, salt and pepper to taste. Serve the crispy confit duck with the Brussel sprouts and bread sauce piping hot along with some nice fruit or fig chutney.